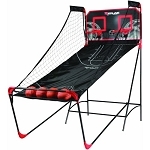 Arcade-Style basketball game - designed specifically for home use. One or two player electronic scoring and time clock - keeps the game moving. Frame is steel tubing - adds sturdiness and stability. Equipped with magnetic scorers for scoring accuracy. Includes (2) mini basketballs and air pump. 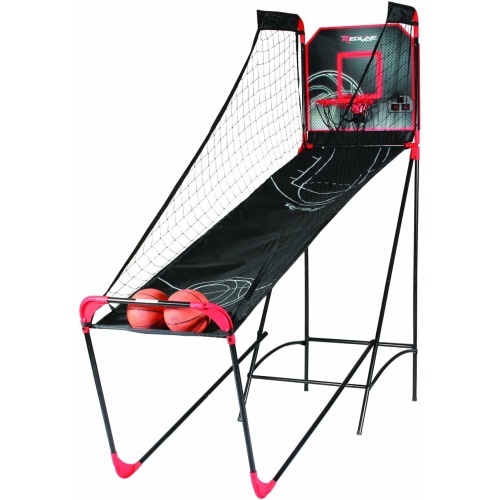 Storage Position: 35 1/2 inches L x 26 inches W x 90 inches H.
Q: Who honors the warranty for this single shot electronic basketball game? Fast Shipping: Orders for the M01480RW Single Shootout Pop-A-Shot Arcade Hoop generally leave the warehouse the next business day. Delivery Details: This product ships directly from the factory in Evansville, IN. This item ships via FedEx and may not require a signature. Dimensions: 34" x 26" x 4"